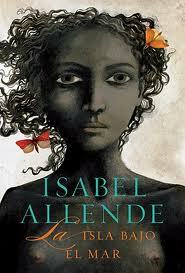 I recently (well within the past two months)finished Isabel Allende’s Island Beneath the Sea. I heard her on NPR a few months ago and decided that I could not keep passing by her books in the bookstore. I purchased the book from El Corte Inglis, a very expensive department store in Spain. It is the combination of Macy’s, Target, Best Buy, and Barnes and Noble with super inflated prices. Island Beneath the Sea is an excellent book;post-colonial/Caribbean fiction at its best discussing themes of Diaspora, slavery, assimilation, and mimicry. All of these themes are further weaved between tales of survival, hope, desperation, freedom, love, and revolution. Although this text is pushing 600 pages, I read it quickly in less than a week. I absolutely could not put the book down as I wanted to know the fate of the slave Tete. I became one of those people who read their book while walking down the street or while going up and down the escalator to catch the train (you know those people we all detest). Now that I’m finished Allende, I have moved onto Salmon Rushdie and Midnights Children – another archetype of post-colonial fiction (although I have not moved past the first chapter). I purchased the Satanic Verses last Christmas. I wrapped it up and put it under the tree for myself. I ended up giving it a classmate immediately after Christmas who said he always wanted to read the book. Although I was sad to depart with my book, I believe that I displayed the true spirit of Christmas! So what are you reading at the moment and what is on your to-read list?